Windows Wallpapers from MSN was a Microsoft application that provided you with a wallpaper manager that allowed you to download new wallpapers from MSN sporadically. Web Wallpaper is a similar application only that it does not use one source to download wallpapers but practically any source that you enter in the application. 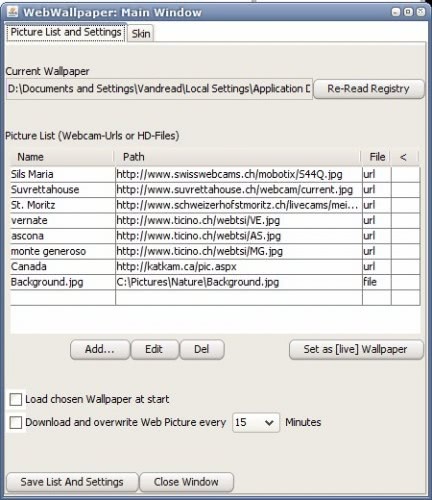 It is designed primarily with webcams in mind but it is possible to configure any url that points to an image directly in the application.You can alternatively add images from a local hard drive or the background image that your are currently using as the wallpaper to the list of available options in the program.One problem that you will run into when using the program is that it does not display preview images. The best option to overcome the issue is by checking the image link in the web browser before you add it to the software. This is of course only an option when you add web resources to it. The wallpaper manager provides two options to change wallpapers automatically. It is possible to change them at system startup or every x minutes where x is a number between 3 and 30. Web wallpaper is a Java application which means that you need to have the Java Runtime Environment (JRE) installed on your system to use the application. The application is only compatible to Microsoft Windows 2000, XP and Vista currently but the chance of porting it to other operating systems is there. The negative aspect on the other hand is that it uses roughly 38 Megabytes of computer memory and about the same amount of virtual memory while running in minimized state which is a lot. Cleaning the memory brought the computer memory usage down to 1.5 Megabytes which quickly rose to about 13 Megabytes but stayed consistent on that level. Please note that the last program update dates back to 2009. It appears that the author has abandoned the program, which may have consequences when you try to run it on newer versions of Windows.